Specimens found on a Calvert Island beach; collection number SCL 15311 in the UBC Herbarium Alage Database. Photo courtesy of Sandra Lindstrom. More details about these specimens and about other occurrences of this species can be found by searching the collection numbers or species name in the database. Turkish washcloth (Mastocarpus papillatus) was recently split into six separate species, one of which is M. vancouveriensis. 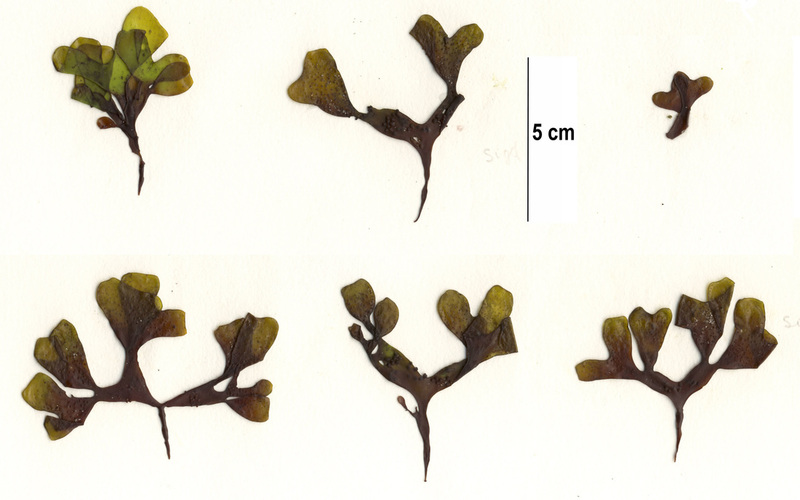 The gametophyte of this red alga is dark red to reddish-black and grows upright to 8 cm tall with a very short (3-5 mm long) unbranched stipe leading into a 10-15 mm long apophysis (swelling). From the top of this swelling the thallus branches into blades. Branching is to three orders, with new bladelets arising from existing blades. Blades are relatively wide and rounded (orbicular to elliptic in shape) and are attached to the rest of the thallus by a narrow stipe. Papillae are found on older parts of female gametophytes. 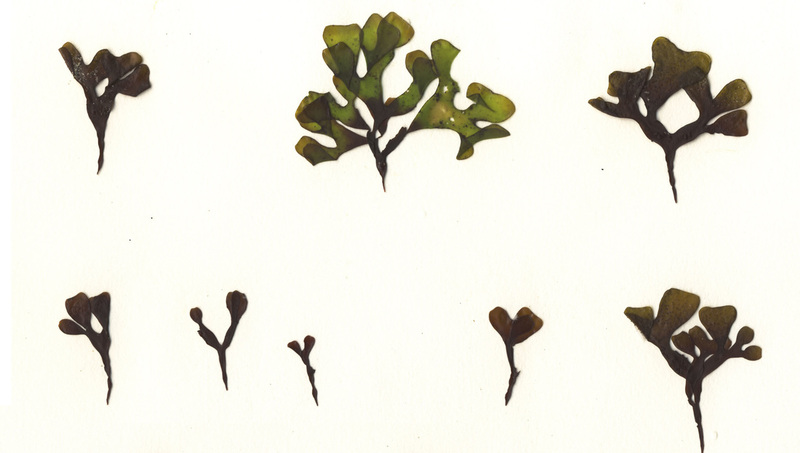 This species grows on rock, often surrounded by sand, and has been mainly found in the high to mid-intertidal. It has been reported from Sitka, Alaska to Cape Mendocino, California. Other Mastocarpus species can appear very similar, and while morphological characteristics, distribution, and location in the intertidal can lead to a field identification, genetic analysis is necessary to be certain of a correct identification. Other species of the genus reported on the BC coast are M. agardhii, M. intermedius, M. papillatus, M. alaskensis, M. latissimus, and M. rigidus. See Lindstrom et al. (2011) for information on these similar species.